What Happens When LIGO Texts You to Say It’s Detected One of Einstein’s Predicted Gravitational Waves? The best thing about a day in my life on the lookout for gravitational waves is that I never know when it will begin. Like many of my colleagues working for the Laser Interferometer Gravitational-Wave Observatory (LIGO), the morning of Monday, September 14, 2015 caught me completely off-guard. For years, we’ve been joking that Advanced LIGO would be so sensitive we might just detect one the very first day it turns on. In retrospect, it’s remarkable how close to reality that joke turned out to be. LIGO is listening for gravitational waves – one of the last unproven predictions of Einstein’s theory of general relativity. In his view of the universe, space and time are fluid things that depend on an observer’s frame of reference. For example, time passes just a (very) little bit more slowly for those who work on the ground floor of an office building as compared to their peers on the 101st floor. Why? They’re deeper in Earth’s gravitational pull. Einstein predicted that gravitational waves are formed when matter and energy warp space and time. Their effects – until now unseen – sound bizarre. 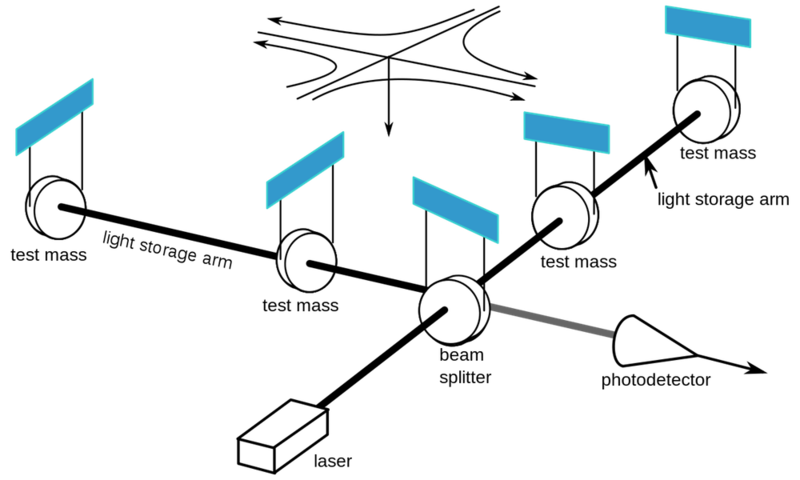 As a gravitational wave passes by, an observer will see the distance between objects change. All around us space is oscillating, distances are changing and we are being stretched and squeezed by passing gravitational waves. Only the most extreme objects in the universe can bend space enough to produce ripples that are measurable here on Earth. The effect is so tiny that we fail to notice it even with the most sensitive measurements – but Advanced LIGO was designed to change all that by directly measuring tiny ripples in space itself. 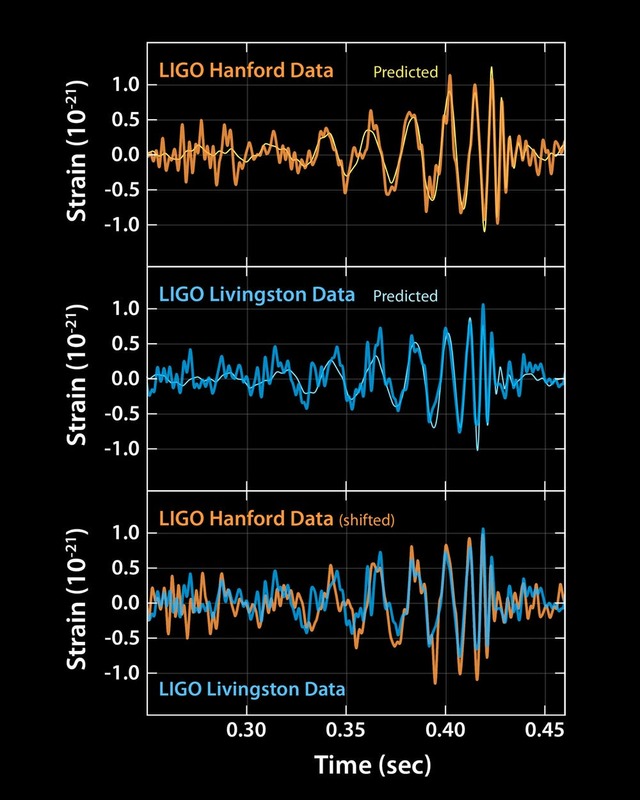 Although Advanced LIGO had collected data off and on over the summer of 2015, September 14 was slated to be the first official day of its first observing run. 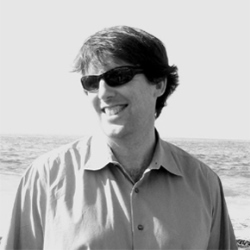 From those who built and commissioned the advanced LIGO detectors to those who characterized and analyzed the data, we’d all been preparing for decades to make this kind of discovery, but I don’t know if any of us was truly ready for a detection – and on Day One, as luck would have it. Like others on the team, I should have been woken up in the middle of the night when LIGO heard that first gravitational wave – but it was so early in the run that I hadn’t even had a chance to enable my text message alerts! Instead, I read about the event, termed GW150914, on my phone as I walked to campus hours after it had been observed. It is difficult to describe the level of anticipation regarding a possible event. But I can say that if you have waited for over 12 years for such a discovery, as I have, it certainly is not something to take lightly when it happens. Like everyone else at the time, though, I thought this signal was just a test of the analysis system, called a hardware injection. I spent the rest of the morning assuming as much. But minutes before a 2:00 p.m. seminar that same day, we received word from each LIGO observatory that no tests had been performed. My student, two postdocs and I all went to our seminar looking like we had seen a ghost! The rest of our colleagues in attendance were not part of LIGO, so we couldn’t say a word. Our silence stood for months to come. The LIGO Scientific Collaboration (LSC), of which I am a member, is currently made up of more than 1,000 people from dozens of institutions and 15 countries worldwide. 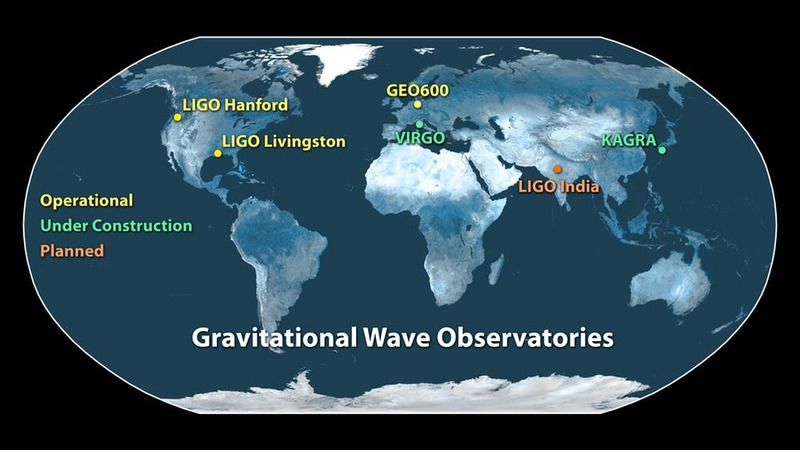 There are two LIGO instruments, one in Louisiana and one in Washington. And we work with the Virgo Collaboration that operates a detector in Italy and the GEO600 detector team in Germany. Since we are all so far apart, we met by teleconference so folks who are at the observatories and folks who are analyzing the data could all discuss what was happening and whether or not to share the information more broadly. At first it was unclear which of many possibilities could be responsible for the GW150914 signal. It would have to be a major astronomical event that released immense amounts of energy – such as a binary merger, a nearby supernova or some completely unforeseen occurrence. Initial investigations indicated that it could be a binary black hole merger – two black holes that are driven to smash together as they release energy in the form of gravitational waves. Over the next few weeks, we worked to assess the significance of GW150914. Its probability of being the real thing was simply off the charts and had virtually no plausible explanation as anything but a gravitational wave. There was just no way random noise could have caused such a loud, consistent signal between detectors that matched the expectation of general relativity so perfectly. From then on, the collaboration shifted into high gear, preparing additional scientific publications to provide all the juicy details about the detection and interpretation of GW150914. We now know that gravitational waves can be measured, binary black holes exist and that there are perhaps far more detectable sources of gravitational waves than we had anticipated. GW150914 stretched and squeezed our nearby space by about 1 part in 1021. This is equivalent to squeezing the entire Milky Way galaxy by a typical person’s height. As you might imagine, it is nearly impossible to measure such a small change in distance. To do so, LIGO uses high-power lasers, ultra high vacuum and some of the most advanced optics ever built. 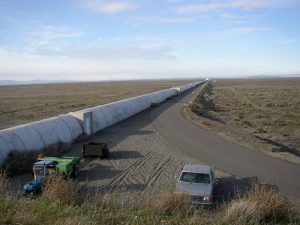 The basic idea is simple: LIGO has two 4-km-long arms built at 90 degrees with respect to one another. A high-power laser beam is split in two to travel down each arm separately. When the laser gets to the end, it’s reflected back by a mirror. If one arm is longer than another, due to the change in space caused by a gravitational wave, then the laser light won’t arrive back at the same time in each arm. We continuously record the recombined laser light; it encodes how the gravitational wave causes space to stretch and squeeze at frequencies that are very similar to what the human ear can hear. That’s why we often think of LIGO as listening to the universe. In fact, LIGO records its data as what’s basically an audio file. You can literally listen to the gravitational waves detected with LIGO using headphones. Colliding black holes and neutron stars are some of LIGO’s primary targets, though we also search for supernovae, spinning isolated neutron stars and gravitational waves left over from the birth of the universe. The LIGO detectors, for the most part, are sensitive to sources all over the sky, which means a single detector can’t tell from which direction a gravitational wave arrived. However, using multiple detectors we can localize the source. 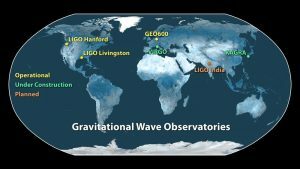 All the gravitational wave detectors across the globe work together to make observations of the same signals at the same time (within tens of milliseconds). 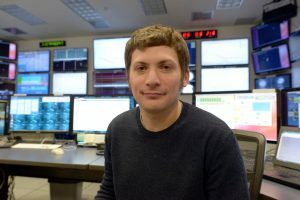 I’m part of a team that is searching for merging neutron stars and black holes in near real time. We hope to know within seconds that a gravitational wave has reached the Earth. With this knowledge, we can inform other astronomers who can point their telescopes in the direction of the event in the hope that the gravitational wave will have an electromagnetic counterpart. Having information from both channels is a bit like having both sound and picture when watching a film. The movie would be far less interesting with only one and not the other. Unlike many telescopes, LIGO can observe at any time of day, though it is sensitive to environmental noise that’s often caused by human beings working nearby. Observing at night tends to be easier, when most people are in bed. The team I work with is always on call. If a gravitational wave event is detected, we should know within a minute and receive a call to our cellphones as well as a text message with details about the event – just as happened on September 14. Detecting this first gravitational wave event has changed the world. It confirms the last great prediction of a revolutionary theory that’s now over 100 years old. But it doesn’t stop there. 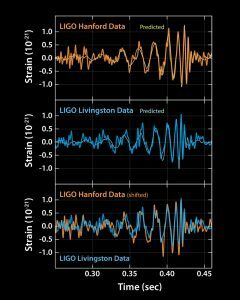 We’re still listening for more gravitational waves; soon Advanced LIGO will detect them regularly – and each one will tell us something new about the universe. As observations become commonplace, we will enter a new era of gravitational wave astronomy and start to map out just how black holes and neutron stars are born, evolve and eventually die. Someday we might even be surprised to detect something we never expected. From now on, every time my phone rings, that’s what I will be hoping for. This entry was posted in Physics, Science. Bookmark the permalink.